A Summoner who is driven by revenge and the desire to prove herself as a competent wizard. An Eladrin born into a wealthy and influential family in the high city of the Feywild, Lorien, Syldra was born the sister of another, whom she was separated from at birth as he was destined for great things while she was meant to be the daughter of a wealthy patron and to represent him. She carries with her half of a locket, the other half being with her brother. 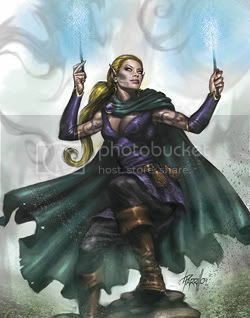 Even though she was discouraged from training in the art of wizardry, the art Eladrin are most famous for, and was told to give up in her efforts. Despite the disbelief from her teachers and even her own family, Syldra trained in secret in the art of summoning, slowly learning the art and beginning to show some mastery. However, one night the eve of her 31st birthday, her father was set up upon by an assassin known only as “Machine.” She entered her father’s chambers to find him slumped over his desk with a cloaked and hooded figure with menacing, cold eyes standing over him with a knife stained fresh with blood. Driven by remorse she conjured all the power she had, but her lack of skill and experience led to her ultimate defeat by the mysterious Machine. He however left her alive and left the chambers without a word. Syldra is know traveling the outer world in search of her father’s killer, with the only memory of him to go by are the cold, menacing eyes. She is vigilant in her search of the “Machine” and will not rest until she exacts her revenge. During her travels she has gained much more experience in her summoning art and has become a respectable wizard, refusing to return to her home until she avenges her father and proves to the elders and her family in the Fey of her skill.